St. Martin's Griffin, 9781250134967, 272pp. 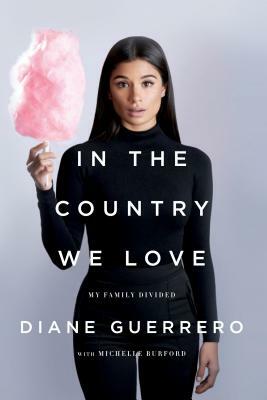 Diane Guerrero, the television actress from the megahit Orange is the New Black and Jane the Virgin, was just fourteen years old on the day her parents were detained and deported while she was at school. Born in the U.S., Guerrero was able to remain in the country and continue her education, depending on the kindness of family friends who took her in and helped her build a life and a successful acting career for herself, without the support system of her family. In the Country We Love is a moving, heartbreaking story of one woman's extraordinary resilience in the face of the nightmarish struggles of undocumented residents in this country. There are over 11 million undocumented immigrants living in the US, many of whom have citizen children, whose lives here are just as precarious, and whose stories haven't been told. Written with bestselling author Michelle Burford, this memoir is a tale of personal triumph that also casts a much-needed light on the fears that haunt the daily existence of families likes the author's and on a system that fails them over and over. Diane Guerrero is an actress on the hit shows Orange is the New Black and Jane the Virgin. She has written about her family in the Los Angeles Times and has appeared on CNN to discuss immigration issues. She also volunteers with the nonprofit Immigrant Legal Resource Center. She lives in New York City.